Lucy Tipler’s first proper job was as an assistant on the Sunday Telegraph Foreign Desk, ironically, just as the 2003 Iraq War started! This was such a full-on role and she was thrown in to the deep end, providing first-hand support to the journalists in Iraq and around the world. She managed critical and life-threatening situations for the journalists, often getting them out of dangerous countries immediately, and once assisting them and their families when arrested in hostile environments – so she knows what it is like to work under serious pressure! For this she was promoted to manager in the first few months and stayed there for four years as she loved the adrenaline rush! After that Lucy decided she would like to try her hand as an Executive PA so became PA to the chairman and MD of a property recruitment company in Mayfair. It was glamorous, but they had a work hard/play hard ethos – she wore so many different hats in that job and had to be everything to everyone, extending her experience to HR, and assisting in the opening of offices around the word as they became a global AIM listed company. For perks she got to travel all over Europe, and eat at the top London Restaurants but for this, incredibly long hours and responsibility were expected. It was amazing training and she also became an adept events coordinator – arranging very large events abroad and in London. As the property market crashed, a lot of staff there were made redundant which was a very hard time in Lucy’s life, but she had a lot to offer now and had learnt amazing skills so she picked herself up and started working again within the week – determined not to let it get her down. After 10 years in London Lucy decided to move to Kent and became Executive PA to the regional MD of a large national insurance brokers. After having her daughter she realised they only wanted full time support and after 4 years there, she wanted to work part-time and spend valuable time with her baby. During maternity leave she pondered how to go about this conundrum and and wondered how she could freelance as a PA – googled it and found out about VAs! Your Loyal VA started in November 2015. We wanted to find out all about Lucy and her business so asked her to tell us more. 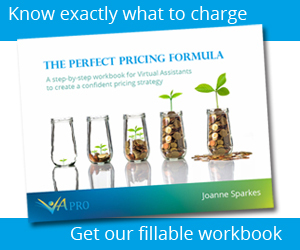 I ordered Helen Stothard’s amazing books, ” 30 Day Setting up as a Virtual Assistant Challenge without breaking the Bank” and “The A to Z of Virtual Assistant Tools” – and rose to the challenge! It took me 5 months to set up as I had a baby to look after but I self -trained myself with everything I thought I would need to know about, I listened to every webinar I could get my hands on, learnt WordPress over the Summer and created my own website, started creating my social media sites and got out networking – which was terrifying -but it all paid off. My first client came soon after my first networking meeting, and a wonderful lady in that networking group had seen a Facebook post earlier that day from a friend of hers needing admin support and she knew I would be perfect for the role. The clients were just right for me and needed help with distributing their amazing apps for women – which I so loved doing. Helping other women feel better is a big part of who I am so it was the perfect fit. No not really, I am still waiting for my niche to find me! I love being open to all jobs that come my way – it expands my horizons and experience too which i love. I can’t get enough of learning new things. I have 4 retainer clients and a few ad-hoc clients, as my daughter goes to school this September I hope to start working a 5 day week so that will hopefully allow me to expand my client base even further. I have surrounded myself with other quality VAs I know I could rely on if I needed support. I know their niches and what they are good at and I have associates on standby for whenever I need them – but I think I will need them more when I go full time. Keep costs down – everyone tries to sell you things you either don’t need, or you can get for free with a bit of digging. Jo Malone recently said in an interview that this is how she became so successful – keep costs to an absolute minimum and you will fly. I find if you spread yourself too thin trying to do a bit of everything then you don’t get anything done – focus on clients first and the rest will follow when you have more time. Confidence through the hard times – all freelancers have an excess of clients and then a dry patch and it’s managing those peaks and troughs. Apparently you get used to it though! I am at my desk for 8:45am and prioritise my actions for the day – which clients need what doing first, focus on each client at a time and set the Freshbooks timer and I’m off. It could be completing metadata sheets for app developers to be distributed globally, or creating agendas/doing minutes for people; general administration duties for retainer clients, or assisting people with their memoirs. I love the variety of it – I never wake up on Monday morning dreading the monotony of the office any more. I do need to get away from my desk more though – its my New Year’s resolution – I get so engrossed with something I sit there for 8 hours without a break and get all stiff and it can’t be good for me! Maybe a dog would ensure I get out for a walk! Helping a client get all her life memories into order ready to get printed and published. It was something she had always wanted to do but didn’t know how to go about achieving it. It was a lovely surprise for her family. Do you have any funny stories/anecdotes about jobs you’ve done? Lots of funny stories during my corporate life – especially on Fleet Street but not sure they are printable! The variety, meeting new and exciting people, not knowing where the next job is going to come from, owning your own business and not being answerable to anyone but yourself. The erratic income is hard to predict sometimes, it’s wonderful when everything is running smoothly but clients come and go depending on their paths so you have to be really flexible with your life and expectations, which for a PA who likes to be in control can be hard at times! Don’t say yes to every client – you are the boss – trust your instincts – only work with clients who you know you can work with and have a good rapport with and will treat you with respect. Loyalty (hence the company name! ), Integrity, efficiency and intelligence to look ahead and see what might be around the corner, the consequences of everything you do for a client – and the guts to advise them about it. You have to be self-motivated and a self-starter and the world is your oyster!